No one knows exactly how old the Runes are. Rune-like symbols have been discovered in caves with inscriptions being traced back as early as the late Bronze Age (circa 1300 BC), Runes and their symbols have been painted on the shields of warriors bent on conquest, and references of Runes have been mentioned in earlier testaments of the Bible. Eminent scientific Runologist, Dr R.I. Page of Cambridge University, acknowledges that the Runic symbols were well established forms of communication, and suggests that they had been used for some centuries before the time or need of written language. Page implies that the Runes, found wide-spread across Northern Europe and Britain, were used in both ritual and as an Oracle for consultation (An Introduction to English Runes 1973 & 1999, and Reading the Past - Runes 1987). According to the perspective of the Germanic peoples themselves, the Runes came from no such source as mundane as the Old Italic Alphabet. Oh no! And what’s more, they command that the Runes were not thought up nor invented. Instead, the tale goes on to spin the story of Odin - a widely revered Nordic God, father of Thor, and seeker of great knowledge - hanging upside down from the Yggdrasil, or World Tree, peering into the wise waters of the Well of Urd. For nine long nights, Odin hung on this tree with no food or drink. And in this state of sacrifice he withered, until he peered into the depths below and spied the Runes! With this, he seized them up and then overcome with dizziness, he fainted and fell. Once he awoke, he spoke of a renowned wisdom which brought him joy and sustenance for self growing. When I was 12 years old, my Mother - an Intuitive and Clairvoyant - was told to gift me with my first oracle; and with this, she gave me my first set of Viking Runes. My earliest and most esteemed teacher of the Runes, Ralph H. Blum, wrote some of the first words I ever studied as a child. Blum’s humble approach to the Runes is that of deep Self connectedness. He shares that the motto of the Runes is nothing more than “Know thyself”. The Runes are a teacher and a powerful source of guidance. They are not a fortune teller or a seer of all that is - they are simply a medium or a bridge, if you will - used to communicate wisdom between your-self and your Higher Self. Blum goes on to tell his readers, and soon to be students, that inside all of us is, in fact, an Oracle. When we pray, seek out information, or ask for what we need, we are exercising our own oracular abilities, reaching out to a Source - our Knowing Self - within. We are living in an age of radical growth and self evolution. The lessons come faster and faster as our souls and the Universe (enter in your concept of Source) guide us into new spaces for growth and prosperity. You are your own guide, your own creator, and at the end of the day you determine the meaning or importance behind each scene and circumstance. The well known Swiss Psychologist, Carl Jung, affirmed that “theoretical considerations of cause and effect often look pale and dusty in comparison to the practical results of chance”. Suggesting that nothing is too insignificant to inspire or let forward a moment of inner knowing or self-guided direction. 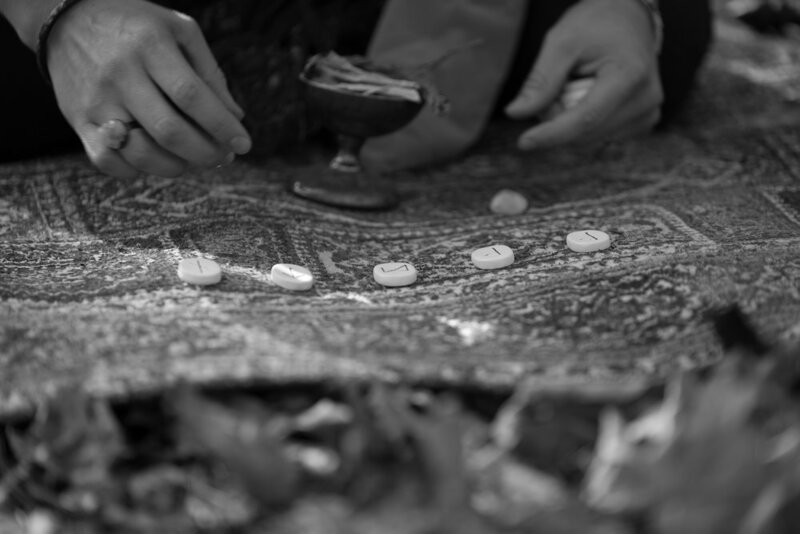 And when we consult the Runes, it is our need that summons the energy of the Runes into sacred play. When you are facing a situation with limited information or you feel like you have exhausted your own resources of insight, seeking counsel from the Runes at this time could be most profound. To begin you will want to close your eyes, take a couple deep breaths and center yourself. Some prefer to light a candle and burn sage or palo santo to signify sacred space. Once you are ready, allow your mind and heart to focus on the issue at hand. With this, you will reach into the bag and make contact with the stones, moving your fingers around them, allowing the right stone to reveal itself to you. This is where practicing your intuitive communication with self is important. Some people share that the ‘right Rune’ appears warmer than others, or sticky to the fingers, or it may give you a pull in your belly. Whatever your experience, there is something different in this moment that signifies a “THIS ONE, TAKE ME, PICK ME” sort of sensation. And depending on what kind of a Rune cast you will be participating in will determine how many Runes you will be asked to pull. In the beginning pages of R. H. Blum’s The Book of Runes, he brings forward an interesting distinction between asking for an answer to a question rather than bringing forward an issue at hand. Here Blum shares that asking a question, for example: “Should I quit my job?”, is much different than bringing forward to the Runes, “I have an issue with my career”. The distinction here is that of importance, whereas in answering the first articulation, you will simply get an answer. However, when you ask for counsel on an issue at hand you can actively participate with the responses you get. In this example, when you bring forward the issue of your career, the Runes will respond to that issue and from that you can extract your own meaning and self reflection. Blum states it is important for you to determine what your right action is. It is also important to add that you do not always need to have a specific question or issue in mind, it is also a common practice to approach the Runes with an open mind and heart and simply ask the question, “What do I need to know for my path now?” Have trust in the Oracle’s response and know the casting will provide you with opportune and instructive play. Occasionally, you may find that the Rune spread you receive is not in alignment with your question. This is what a Rune Caster would call a Runic Override. With this, an override can act as a bit of a fail-safe, where the Runes bring forwards an issue that has been long repressed, ignored, or one of timely significance. In some cases the individual receiving the reading may be floating between two questions in their mind, and in this case the Runes will choose the one needing most acknowledgment.